This week, we’ve been following the rather silly story of Don and Evelyn Knapp, owners of the Hitching Post in Coeur d’Alene, Idaho, a wedding mill that until recently advertised that they performed all sorts of weddings, religious, non-religious, etc. Unfortunately, the Knapps are apparently homophobes, and in reaction to legal marriage equality in Idaho, decided to preemptively sue the city, which has a nondiscrimination ordinance. The organized religious right had (read: orchestrated) a massive, dishonest temper tantrum, claiming that the Knapps were going to jail, that they were going to have to pay exorbitant fines simply for having “deeply held religious beliefs,” etc. Bryan Fischer, that paragon of intelligence and fact, claimed that they were going to be out $180,000 simply for being sweet Christian people of the God Hates Fag denomination of Christianity. The not smart parts of the internet, easily led as they are by anyone who confirms their quivering beliefs that the Big Gay Left is out to get them and send them all to concentration camps, slurped up the story (just an example) like it was their last meal at Ryan’s Family Steakhouse, and imaginary persecution reigned over them, as they trembled in fear waiting until that moment when Big Gay came for them. Of course, the story was complete BS in the first place. Now, if those Idaho “pastors” (this is not a church, remember) had continued with their original business policy (pictured at right), they would have been indeed in violation of the city’s nondiscrimination ordinance. Of course, Jeremy Hooper discovered that the Knapps hastily changed that policy to explicitly allow only straight Christian couples, and reorganized their business as a specifically religious organization, probably at the suggestion of the Alliance Defending Freedom hate group. So, because the Knapps quickly changed the entire business plan for the Hitching Post, they won’t have to worry that the vicious gays and the government will round them up, fine them, death panel them, Benghazi them, Ebola them, Fast and Furious them, force them to eat healthy vegetables from Michelle Obama’s garden, or whatever the hell else terrifies these people. They’ll probably lose some money for changing their whole business plan because they hate gays, but those will be the consequences of their own decisions. 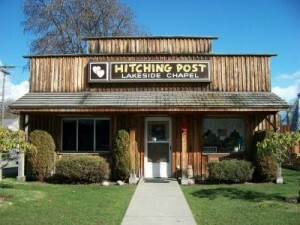 So, all the wingnuts can sleep easily tonight, secure in the knowledge that some roadside wedding stand in Idaho is safe from Big Gay. I guess they’ll have to find some other fake story to cry about.